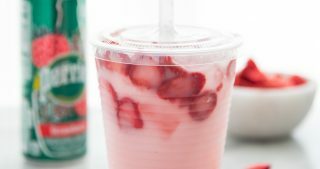 This post was generously sponsored by Sprouts Farmers Market but all opinions are my own. 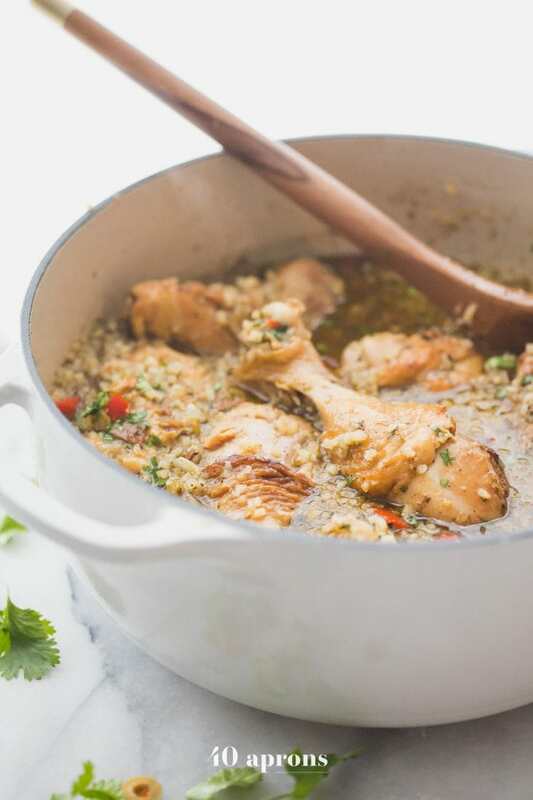 This healthy Spanish chicken and rice stew is keto and low carb thanks to cauliflower rice! 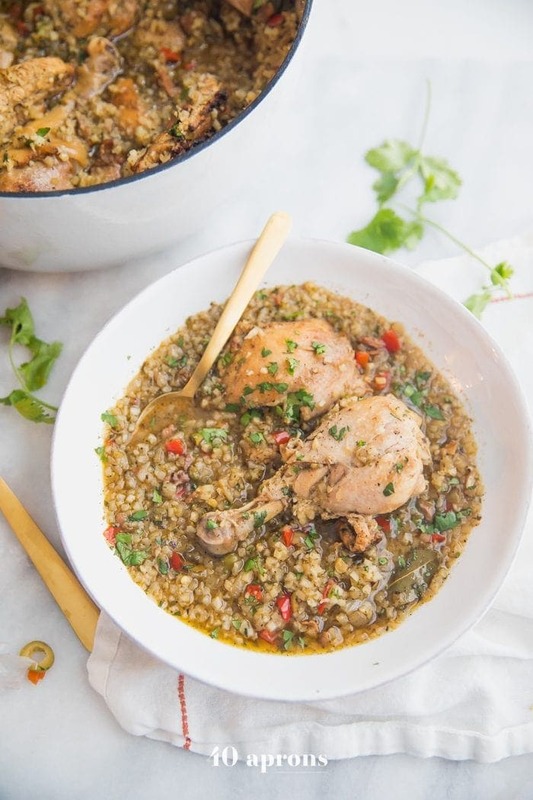 Loaded with lovely Spanish flavor, this Whole30 recipe makes such a filling and nourishing dinner. 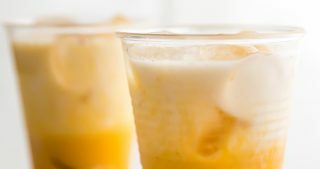 Can we talk about Spanish food for a second? Because I’m not cool with this. You probably don’t know, but we are Spain fanatics. We took our toddler when he was just about one, and we’re planning to take our daughter when she’s the same age. But uh, beyond that? We’re actually planning to buy property there and eventually would like to split our time between living there and in the U.S. Translation: We hella love Spain. It’s the culture! And the wine and the architecture and the art and the sangria and the food. Oh, oh, the food. But you know what I’m not cool with? Spanish food totally gets the attention short stick when it comes to European cuisine. We get it: French food is awesome. I know: fish and chips are pretty damn good. Hey, I freaking love pasta, too. OK! But if you’ve ever had real Spanish food? You know that it deserves all the glory, too. 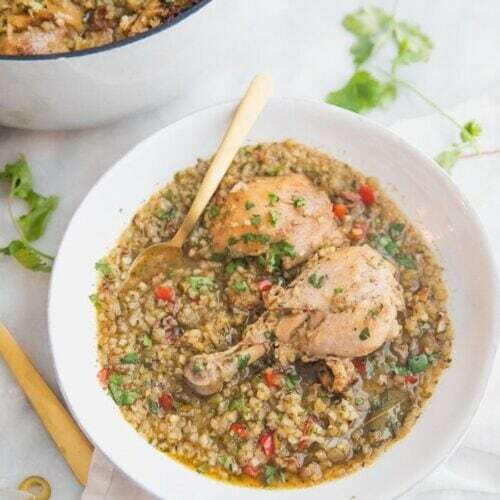 I was inspired by the flavors I fell in love with in the Iberian to make this healthy Spanish chicken and rice stew, loading up on Spanish Manzanilla olives, sofrito (a base of aromatics native to Spanish, Portuguese, and Latin cuisine), and prosciutto. The result is something somehow simple but insanely complex, filling and nourishing. 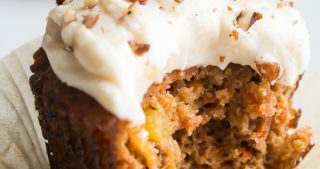 It fits beautifully into any Whole30, low carb, or keto dieting, totalling out at 6.9 net carbs! The layering of flavors makes this recipe so delicious without being overpowering. 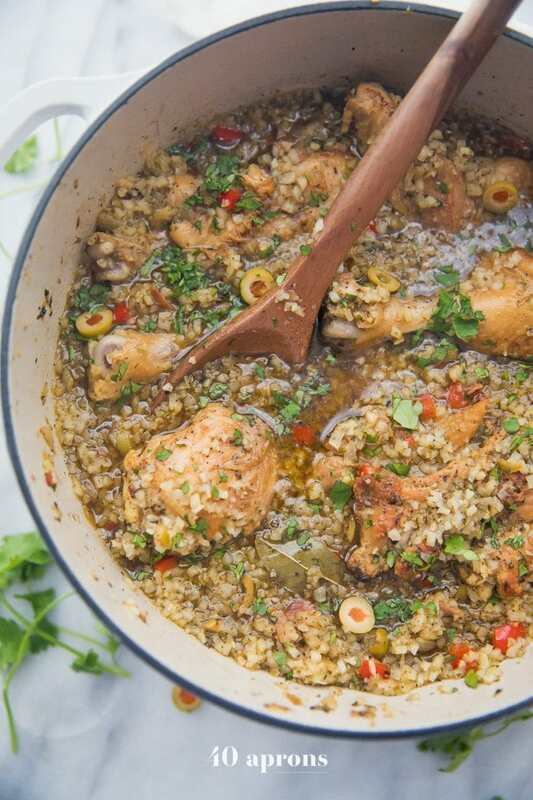 The ingredients makes this healthy Spanish chicken and rice stew flavorful without being complicated to make. Braising the chicken makes it so tender and is quite easy! 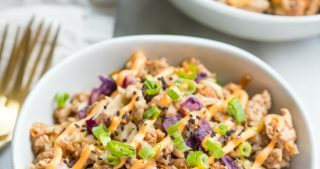 Using cauliflower rice makes this recipe Whole30, low carb, and even keto. 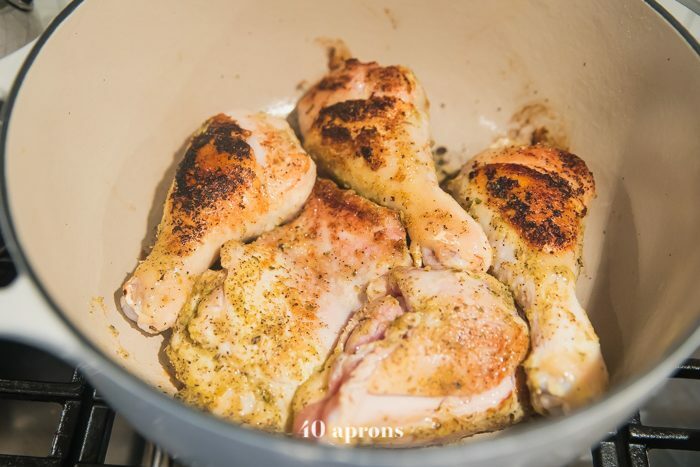 Don’t skip the browning of the chicken! This is key to gorgeous flavor and tender chicken. Even if you’re not a big olive fan, I highly recommend you keep the olives in the recipe. I honestly can’t even taste them as an ingredient when I eat the stew, but they add so much to the flavor. Make sure you simmer your chicken long enough to be cooked through but not so long that it overcooks. 20 minutes is a good benchmark for boneless pieces; 30 for bone-in. 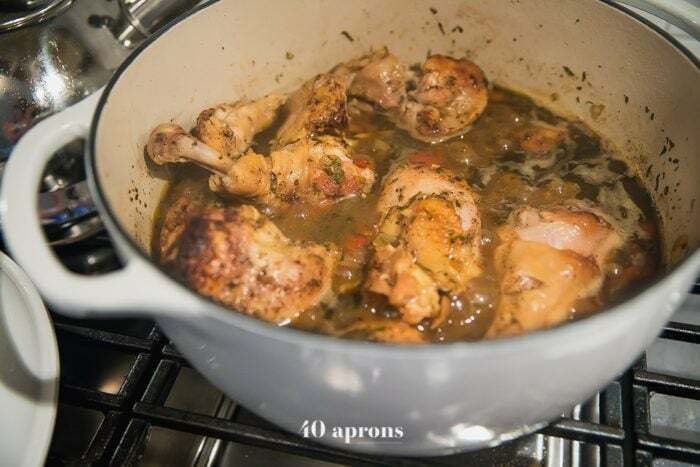 Use cheaper cuts of chicken, like chicken thighs and drumsticks, to make this recipe super economical. Here’s what you need! I get everything from Sprouts Farmers Market. Season your chicken pieces liberally with adobo seasoning. I use the adobo seasoning from the bulk spices section at Sprouts, which makes it super easy. But you can make your own, too. 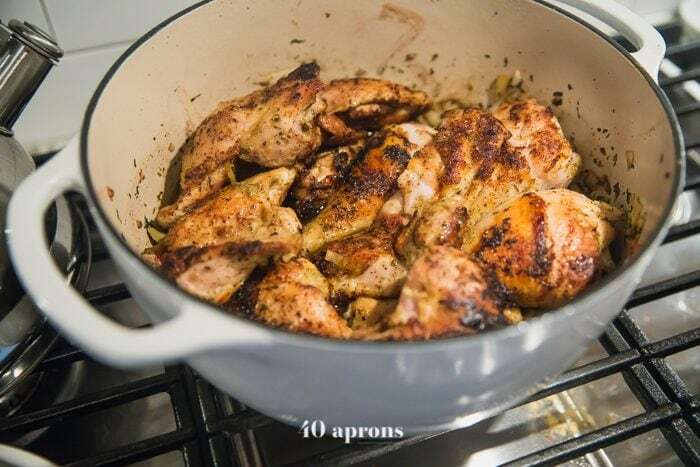 Brown your chicken on all sides in a Dutch oven with a bit of avocado oil. Transfer to a plate. 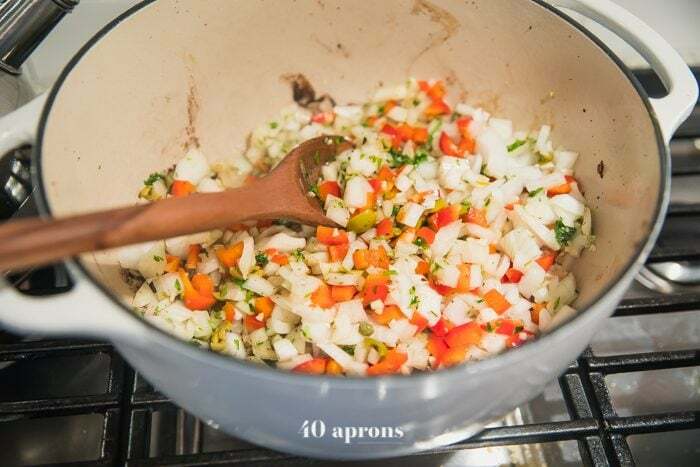 Add your sofrito mixture to the Dutch oven with a little extra oil and sauté until tender and softened. Add your chicken stock and bay leaves to this mixture when softened, then return your chicken to the pot. Bring the mixture to a boil then reduce heat to medium-low and cover. 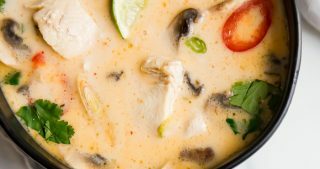 Simmer for 20-30 minutes or until chicken is cooked through. Uncover the Dutch oven and increase heat to medium. Stir in your cauliflower rice and heat through, simmering for about 5 minutes. Season with plenty of salt then serve with extra green olives, if you like them, and more fresh chopped cilantro. 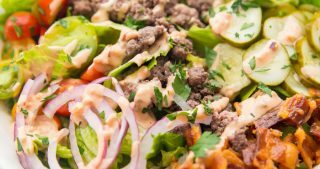 Is this recipe Whole30 compliant? Yep! Just make sure your prosciutto is Whole30 compliant, as well, but most are. Be sure to read the ingredients on your chicken stock carefully, too; way too many include sugar of some form. I love Sprouts’ bone broth – it’s compliant as well as especially nourishing! Use your heaviest pot instead. 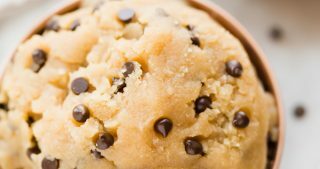 You’ll want to make sure it’s pretty big, since, after adding all the ingredients, this recipe makes a pretty good amount! 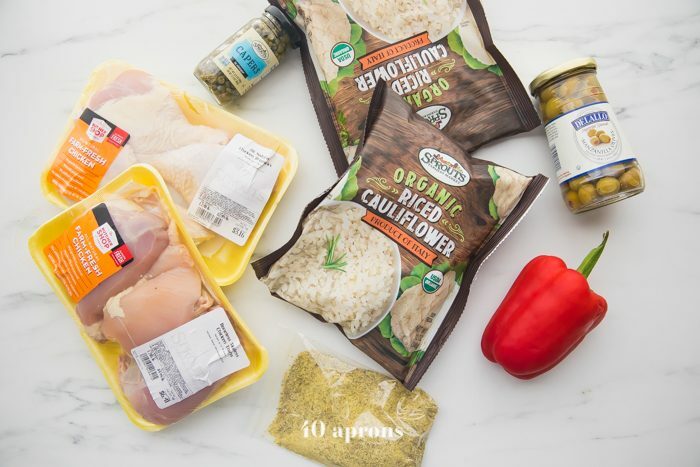 Can I make this healthy Spanish chicken and rice stew recipe as meal prep? Absolutely! 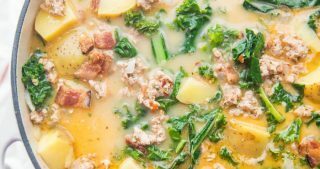 This Whole30 recipe tastes even better the next day, and it makes quite a lot with not a lot of effort. It’d be such a fantastic, filling lunch during the week. Yep! The net carbs (Total carbs minus dietary fiber) come out to less than 7g carbs. For your whole dinner! Whoa. Help! I can’t find adobo seasoning. If you can’t find adobo seasoning, make your own! 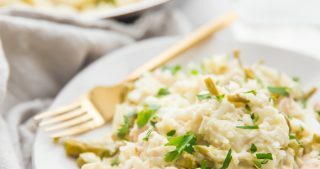 This recipe is really simple and so flavorful. 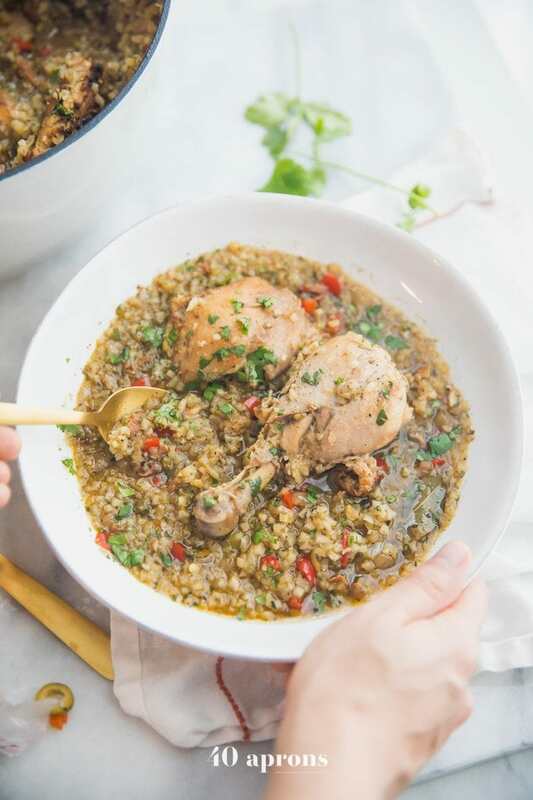 This healthy Spanish chicken and rice stew recipe is Whole30, paleo, low carb, and keto, thanks to cauliflower rice! Absolutely loaded with flavor, it's an easy dinner recipe that's so filling and nourishing. In a small bowl, combine adobo seasoning and 1 tsp. salt. 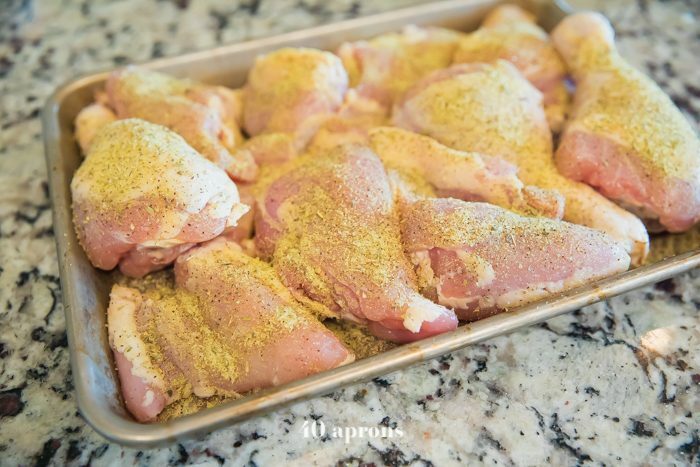 Sprinkle adobo seasoning mixture liberally over both sides of all the chicken pieces. Heat 1 Tbsp. oil in a heavy Dutch oven over medium-high heat. Working in batches, carefully add chicken pieces to pot and brown on both sides, about 3 minutes per side. Transfer to a plate. Add 1 Tbsp. oil to pot and reduce heat to medium. Add sofrito ingredients and sauté sofrito until tender, 5-8 minutes. Add prosciutto to pot and stir well. Add chicken stock and bay leaves sofrito-prosciutto mixture, then return chicken to pot and stir. Bring to boil. Reduce heat to medium-low and cover. Cook 20-30 minutes. Bone-in pieces like drumsticks or bone-in thighs will take longer, about 30 minutes. 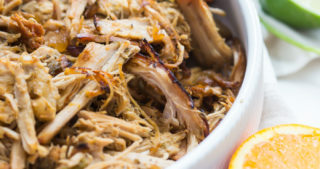 Boneless, skinless chicken thighs will only take about 20 minutes. If using a mixture of bone-in and boneless pieces, cook 30 minutes or until bone-in pieces are all cooked through. Uncover and increase heat to medium; stir in cauliflower rice and stir well. Simmer uncovered for 5 minutes. Add salt. Garnish with extra green olives and fresh chopped cilantro. Great recipe.skipped the prosciutto and cilantro as I didn’t have on hand but still turned out great! Will make again.